Browse Nord | Musical Instruments | GAK. GAK are proud to be an official Clavia Nord Super Centre selling UK stock with a 2 year warranty. 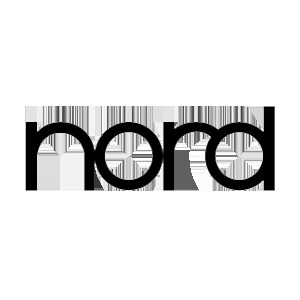 Handmade in Sweden with meticulous attention to detail, Nord keyboards, synthesizers and digital pianos come with the highest level of quality control. Just as comfortable at home or in the studio, Nord keyboards combine superior sound quality with an intuitive layout design that makes nord keyboards excel under the pressure of live performance. Clavia released their first synthesizer known as the Clavia Nord Lead. From the utter success of the Clavia Nord Lead, Clavia later released several more Nord Lead virtual analog synthesizers which all included sequencer versions entitled the Nord Rack x; the Nord Lead 2, Nord Lead 2x and Nord Lead 3 are all versions of the Nord Lead. Soon after the design of the Clavia Nord Lead, Clavia then later released the Nord Modular; a software-based, modular synthesizer. If you require any assistance with your purchase of Nord pianos, synths and accessories, please don't hesitate to contact us on 01273 665400. The Nord Electro 5D 61 is a professional modelling keyboard from the Nord Electro 5 range of Vintage modelling keyboards. A superb combo of vintage electro-mechanical and acoustic instruments in a compact, portable package! Ex-Display, Synth in very good condition, few lights scratch marks on LCD screen, original packaging worn, instructions included. The Nord Lead A1 is a versatile choice for both stage and studio, delivering a beautifully rich and flexible palette of sounds. The strong, metal Music Stand attaches to mounts included on the back of your instrument, and can accommodate four sheets of music. 88 key Digital Piano featuring Nord's A1 Synth Engine, the C2D Organ Engine and a greatly enhanced Piano section. Digital Piano featuring Nord's A1 Synth Engine, the C2D Organ Engine and a greatly enhanced Piano section. (B-Stock) Original packaging worn, keyboard in very good condition. 76 Key Digital Piano featuring Nord's A1 Synth Engine, the C2D Organ Engine and a greatly enhanced Piano section.